See, I don’t watch Jersey Shore and wouldn’t know “The Situation” if I fell over him, but this Paul LePage mural malarkey is almost as bad as reality television. First there was a free speech claim made last week: “Federal lawsuit seeks return of mural to Labor Department“. Then Republican state senators took a swipe at him in the press: “LePage rhetoric interferes with goals, say GOP senators“. AND now the federal Department of Labor is getting in on the action: “US Labor Department demands refund in Maine mural dispute“. See? Reality TV at it’s worst. 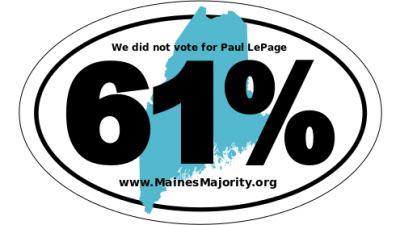 I don’t want to make “this all Paul LePage, all the time” but I have to share this. Mount Holyoke College President Lynn Pasquerella wrote a letter to the New York Times about Governor LePage’s removal of the Department of Labor murals: “Honoring Frances Perkins“. Additionally, here’s the letter that Dr. Pasquerella faxed to his office yesterday. I was particularly surprised to read that you were influenced by an anonymous fax comparing the 11-panel mural to North Korean political propaganda, because the act of removing images commemorating Maine’s history itself conjures thoughts of the rewriting of history prevalent in totalitarian regimes. If the U.S. Department of Labor in Washington, D.C. is housed in the Frances Perkins Building, why can’t she be honored with a conference room in Augusta? So we’ve had Jon Stewart, Rachel Maddow and countless blogs chime in on Governor LePage’s decision to remove murals from the Department of Labor. Which of these is funnier? A thanks to all of the people who voted for Mitchell, Moody or the other one there. You brought us to this. Governor, you might be able to erase some of Maine’s memory, but you’ll have a hard time erasing the nation’s memory – even if it’s not in keeping with your pro-business goals. 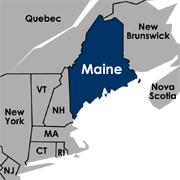 Interesting new bill proposed by Republican Senator Thomas Saviello: LD 607 (SP 187) “RESOLUTION, Proposing an Amendment to the Constitution of Maine To Require the Governor To Be Elected by a Majority Vote“.